Two lucky families received an early Christmas present of unique New Forest Marque sausages this week made to their winning recipe. Chris Oakes (New Forest Marque butcher) and children with the winning sausages. 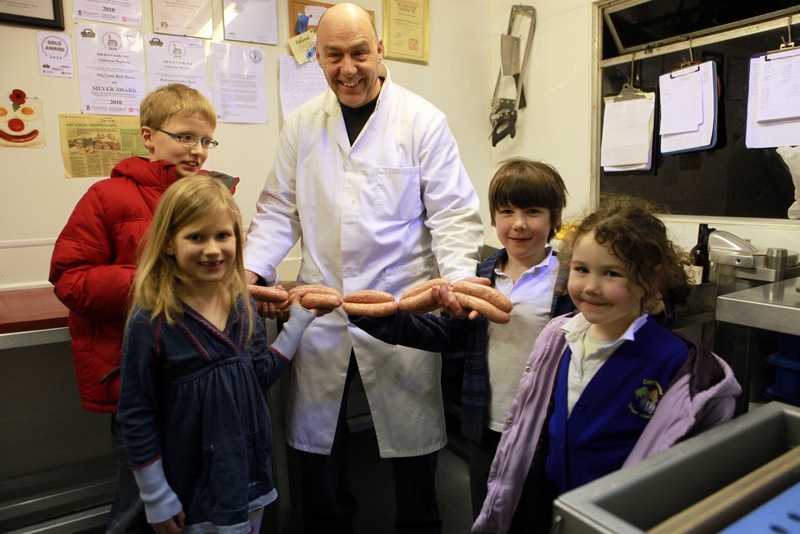 The families entered the Marque’s ‘design your own sausage competition’ to celebrate National Sausage Week in November. Their recipes were made into delicious, tasty sausages by Marque member Chris Oakes, of Oakwood Butchers at Setley, Brockenhurst. Other recipes that Chris brought to life were a New Forest forager’s sausage with mushrooms, walnuts and crab apple jelly, a bonfire banger with roasted pumpkin and chilli and an apple and Isle of Wight garlic sausage. Chris said: ‘It’s been great to be part of this competition. National Sausage Week plays an important role in getting people involved in buying good quality pork. I’m passionate about producing high-quality local produce. All my Lop pigs which I rear and butcher spend their lives in the New Forest and Hurn Forest near Ringwood. Sarah Hunt, Manager of the New Forest Marque, said: ‘The ethos of the New Forest Marque is to work with local producers and farmers to help them promote their produce. To learn more about the New Forest Marque visit www.newforestproduce.co.uk and for more information on Oakwood Butchers go to www.oakwood-butchers.co.uk.